The object of this essay is to stimulate an interest in low-level tactics in the Napoleonic Wars and to assist the development of game mechanisms to reproduce platoon and company level Napoleonic wargames. It is a commonly held view that one of the most important developments in warfare at the end of the eighteenth century was the appearance and evolution of the type of soldier usually known as the "skirmisher". The skirmisher is often attributed with wondrous feats on the field of battle, even being seen by some visionaries at the time as the battle-deciding weapon, a view repeated by a number of later propagandists. Over the years, these stories have become embel-lished and a number of myths and a good deal of confusion was grown up over how the Napoleonic skirmisher functioned and what effect he had on the field of battle. This problem is exacerbated by the way in which skirmishing is described in many works, with terminology like: "clouds of skirmishers", "swarms of skirmishers", "fighting in disorder", etc. being used, giving, perhaps unintentionally, the impression that skirmishing was an unorganised, instinctive activity left entirely to individual initiative and carried out by men motivated by patriotic zeal. As with all myths, there is an element of truth in this, but a close study of contemporary reports, accounts by informed eye-witnesses and drill manuals show that this view is far from being the entire story. The first myth which is commonly believed is that the Napoleonic skirmisher originated only from the heady days of the Revolutionary Wars when France's poorly trained but enthusiastic soldiers of the 'levee-en-masse' could only fight in disorganised bodies against the drilled lines of the invaders. Certainly, that was one of the roots of the light infantryman, but the fact of the matter is that irregulars did play some role in most wars and their use was relatively common even in the Seven Years War, the Croatian troops in Austrian service being a particularly good example of this. The Prussians, too, had their 'Freikorps' irregulars, and other armies had similar formations. Such troops were another root of the Napoleonic skirmisher. What was characteristic of the Napoleonic skirmisher was not so much that he existed, but the way in which he was used on the field of battle. In the wars of the eighteenth century, irregulars were used mainly for raids on enemy lines of communication, for scouting and spying on enemy units, as flank guards and patrols. They were considered not really good enough troops for use on the field of battle as they were prone to run at the first sign of danger. There were, of course, notable exceptions to this, the effective manner in which the Austrians used their 'Pandours' at the Battle of Lobositz (1st. October 1756) being a good example. However, it was only in the Revolutionary and Napoleonic Wars that the widescale use of the skirmisher on the field of battle as the first wave of action was seen. The ideal was to combine the skirmish fight with close order actions, wearing down the enemy's resistance with the former, and pressing home the decision with the latter. Skirmishers rarely fought without formed supports in close proximity and it is even rarer to find instances where skirmishers acting in isolation ever conclusively decided an action. Although the Austrians were the innovators in the use of light infantry and led the field, they had yet to combine the fire action of the light troops with the decisive bayonet attack of the line. That was to come later. Frederick's light troops were of such poor quality that he did not care to use them on the field of battle proper. This was largely because he recruited only the most unreliable men into the free battalions, saving his dependable Pomeranians and Brandenburgers for the line battalions. The French Revolution may well have produced the enthusiastic and patriotically motivated conscript, but as there was no revolution in Prussia, the type of manpower available to the army was not of the same character. The years between Frederick the Great's death and the war of 1806 saw the light branch of the Prussian Army develop along lines somewhat dissimilar to that of the French. Both strands in the development of the skirmisher will be examined. Examining the evolution of light infantry tactics over the length of the eighteenth century, one can divide this into three distinct but overlapping phases. Firstly, in the early to mid-eighteenth century, the light troops were used only away from the battlefield, as scouts, patrols, raiding parties, etc., that is, in what is known as the "War of Outposts". Secondly, light troops were brought onto the battlefield by the Seven Years War, but tended to be used only as flank guards, to protect the baggage trains, etc. and not as main battle troops. A notable exception to this was in the Austrian Army which was at this time the most progressive in the use of light troops, using Pandours and possibly even Hungarian regulars in loose order on the field of battle. That can be considered the third phase in the development of the tactical use of light infantry, that is with them operating on the field of battle, but in actions separate to those of the line troops. This phase is characteristic of the light infantry tactics of all of Continental Europe at the end of the eighteenth century and for most at the beginning of the nineteenth century. The Prussians in 1806 were more or less at this stage. Coming into the beginning of the nineteenth century, the fourth and final stage occurred. In this, the skirmisher action was combined with that of the line troops. This was a characteristic feature of the Napoleonic battlefield. The French Army was the first to reach this stage. Until the Revolution, the French light infantry had been trailing behind in development when compared to that of Germany. In 1789, the Austrians and the Prussians were at the third stage, the French were still at the second. However, the rapid development of tactics caused by the Revolution allowed the French to largely by-pass phase three. Most other armies caught up with the French again at the beginning of the nineteenth century. To counter the Austrian light troops, the Prussians founded a number of "free battalions" in the Seven Years War. These formations were a temporary counter-measure. When it came to the War of the Bavarian Succession, the light troops were raised from volunteers from the line, a qualitative step forward. What was really needed was permanent battalions of light infantry. Frederick the Great started this process by strengthening the Foot Jaeger to a regiment of ten companies and by founding three "free regiments". The latter were the fore-runners of the fusilier battalions. Also, from 1787, each company of line infantry formed a section of Schuetzen. They were selected personnel, armed with rifled carbines, holding NCO status and were trained in skirmish tactics. In the same year, the Fusilier battalions were founded. These crack light infantry formations fought in two ranks, not the usual three, and the significance of this will be seen later. Moreover, they were armed with shortened muskets which facilitated aimed fire. From 1791, the Prussians began to experiment with the use of the third rank of the line as skirmishers. The innovator in Prussia was the Duke of Brunswick who had an instruction on this subject printed in 1791 for his regiment (no. 19). In 1797, the Prince of Hohenlohe issued a detailed instruction to the regiments of the lower Silesian Inspectorate of which he was Inspector-General. This was incorporated in the Regulations he issued in 1803 and formed the basis of the "Instruction on the Use of the Third Rank" of March 1809 which was eventually incorporated in the 1812 Regulations of which more will be heard later. From around 1800, the Austrians began to take a closer look at using the third rank for special tasks and as skirmishers. In fact, they had made passing references to such uses of the third rank in the Regulations of 1769. However, they were the only major German state which did not adopt the practice of attaching Schuetzen sections to the line. An entire section of the Regulations of 1807 was devoted to skirmishing. At around the turn of the century, the Hanoverians added Schuetzen sections 60 men strong to their musketeer battalions and made provision for allowing the third rank to be detached and used in support. A Hessian Regulation of 1802 called for the use of the third rank as skirmishers. At the end of the eighteenth and beginning of the nineteenth centuries, the Germans were particularly keen on experimenting with the third rank, and in a number of armies, there were light sections attached to the line as well as independent light battalions. The French Regulations of 1785 allowed the formation of a small piquet attached to each line battalion for special tasks only. Light companies were also founded. The Regulations of 1791 however made no mention of the piquet and did not even discuss the use of skirmishers although the use of the elite companies in a skirmish role was a characteristic of French Napoleonic tactics. The Russians too began to experiment with light troops at the end of the eighteenth century, issuing an instruction in 1789 for independent light battalions known as Jaeger. Before that, in 1765, 25 infantry regiments had received a "Jaeger Commando" of 60 men and from 1769, all infantry regiments received a troop of the same. They fought in two ranks and were expected to fight in broken terrain, even with snow-shoes. They were armed with shortened infantry muskets. As time passed, they eventually became medium infantry. In 1777, the Jaeger sections were taken from the line regiments and formed into ten corps of four battalions, being armed with the standard infantry musket. In 1796, they were formed into divisions and brigades. From 1801, there were 19 Jaeger regiments and in 1811, the third brigade of an infantry division consisted of Jaeger. They fought along lines largely similar to those of the line infantry. There were two basic methods of deploying skirmishers. The first, used mainly by the German armies, was to use Schuetzen sections supported by the third rank, and, as the Napoleonic Wars progressed, the third rank was used independently, supported by the line formations. The second, used mainly by the British and French, was to deploy entire companies of the line as skirmishers. These were usually elite companies of personnel especially selected and trained for that function. In both cases, the skirmishers were a planned and organised part of the battalion and not an undisciplined body of marksmen operating on their own. Skirmish tactics will be examined in greater depth below. Section Three of the Austrian Regulations of 1807 is devoted to the uses of the third rank and presents the reasons why the third rank should be used for special tasks as well as covering the procedures for forming sections of the third rank and how to use them for various tasks. 1) Because it cannot be used in volley firing, two ranks being all that can safely do so. 2) Because it forms a suitable number of men to provide skirmish support to the whole battalion. 3) Because it provides an ideal force with which to support the regiment. 4) Because, by using it away from the main body of the battalion, the men of the first and second rank get to learn something about individual initiative. The Regulations continue by suggesting that sections of third rankers operating in close order can be used to outflank the enemy, extend the frontage of the battalion, form a van or rearguard, as a reserve and as flank guards to a skirmish line. 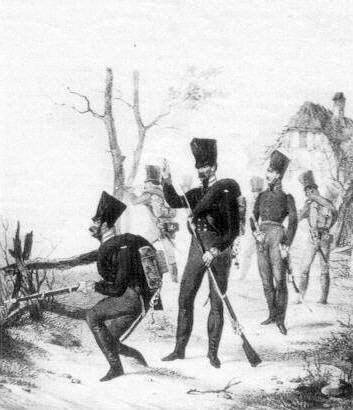 Prussian Fusiliers in skirmish order. Note the two figures in the foreground. The one kneeling is covering his partner whilst the latter reloads. The officer, in the background, is supervising the operation of the skirmish line. This contemporary picture shows that skirmishing consisted of teamwork and leader control. It would probably be of greater interest to examine how the third rank was used in action, and there are a number of sections of the Prussian Regulations dealing with just that. '§5 When Wanting to Find or Attack the Enemy. It is interesting to note that the use of any available cover by the close-order troops is stipulated. Furthermore, it is pointed out that only part of the third rankers should be used in open order at any one time. A reserve of formed troops is always needed to be able to alternate the men in the firing line and to provide them with support and a rallying point. Skirmishers also have to be kept under close control so that they do not fire off all their ammunition too quickly and with little effect. 'If the enemy falls back, the third rank is to follow him quickly; at such a moment, one has to bear something in mind. A part of the third rank of every battalion has to be kept together so that there is a point at which the skirmishers can rally if necessary. One cannot stress enough to the skirmishers that they should not get too far away from this troop and should never wildly pursue the enemy without support. This was done too often in the last war (i.e. 1806) by the German skirmishers, particularly in broken terrain. By so doing, they got lost and the battalion was robbed of its skirmishers. The point so often stressed in this passage is how the skirmishers need the support of close order troops. The formed troops must be there to provide a point to fall back on for defence and to support and exploit the successful attack. Skirmishers acting on their own soon run out of steam and achieve little. '§8 When Attacking and Defending Fortifications and Earthworks. 'When involved in a siege, the skirmishers of the third rank not only within, but also before fortifications are required to shoot at the artillery in the embrasures. - Inside the fortress, they are to form the outposts, making small sorties, etc. - When attacking a fortress, they are to protect the labourers during the night, being positioned in front of them. - In earthworks, they are to take the forward positions, occupying the outposts, etc. This diagram illustrates the basic structure of a battalion deployed for a skirmish fight. The skirmish line is to the fore, under the control of its NCOs. The skirmish captain supervises and commands the entire fire line, and the supports immediately to his rear. The supports are used to relieve the fire line when required or for local bayonet charges. They also provide a rallying point. The battalion column is held in reserve to make the decisive bayonet attack. In sieges, the role of the skirmishers of the third rank is largely one of preparation for the main assault by marksmanship and sniping. 'It is impossible to make rules to fit every circumstance either for the number of files of a formed troop that should be dissolved into a skirmish line or how this should be led. It depends on the terrain, the strength and position of the enemy as well as the objectives one has in conducting the attack or defence. Usually, a formed troop will be used bit by bit in the skirmish fight, sometimes it will all be deployed in one go. It is always a rule that no more men should be used in skirmish order than the terrain and strength of the enemy require. 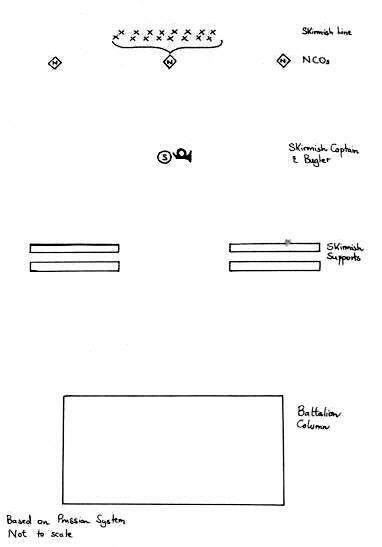 On level ground where no natural obstacles offer the skirmisher cover, then, as a rule, the centre of the platoon which is to disperse should remain standing whilst the files deploy to the left and right. The distance at which one skirmisher should stand from another in the firing line depends likewise on the terrain and length of the line that the deployed skirmishers are to cover. The two points that need stressing in this passage are that emphasis is put on the point that a successful skirmish action is one in which the minimum of men are deployed in skirmish order - in the days of the muzzle-loading flintlock, the decisive action was almost invariably the bayonet charge by formed, close-order troops and even in small scale warfare, it was necessary to keep a section or two formed to press home a successful attack. Secondly, it is clear that effective skir-mishing requires effective leadership - the NCOs control and command the files, the officer instructs the NCOs in the skirmish line, the skirmish captain co-ordinates the close and open order forma-tions, the battalion commander co-ordinates the platoons of the third rank and the battalion column. That is the important point about a firing line of skirmishers. It took so long to load a muzzle-loading flintlock that it was always sensible for men to operate in pairs, with one loaded to give the other cover whilst he reloaded. Both points are important to remember. The support troops should not be exposed to too much danger, but they must be at hand to fight when required. The relevant sections in the Austrian Regulations make a number of comments on how many men are to be deployed in open order. When attacking villages, one-sixth are to be used for the assault, three-sixths as the support and two-sixths in reserve. When defending a village, one third are to be deployed on its perimeter, a further third as supports at the important points and the final third concentrated in the middle as a reserve. This all underlines the point that skirmishers can only operate effectively when they are properly organised and have supports and reserves. Moreover, it was usually only a minority of the light troops that operated in skirmish order at any one time. Thus the stories one reads about "clouds of skirmishers" fighting decisive actions without any support from formed troops should always be treated with scepticism. Effective skirmishing was properly organised. The next part of this series will examine examples of the Napoleonic skirmisher in action to see how much the above theory relates to reality and will attempt to show the true effectiveness of skirmishing in the early nineteenth century.